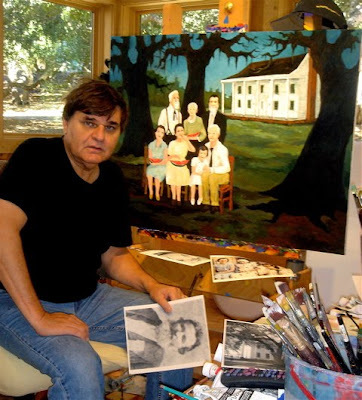 Although George Rodrigue admitted to himself only recently that he is an effective portrait artist, he has painted both real and imaginary figures for forty years, accepting commissions for family portraits since the early 1970s. For the family portrait he feels pressured to please everyone from Great Aunt Marie to Baby Hebert with regards to looks, clothing, and placement. 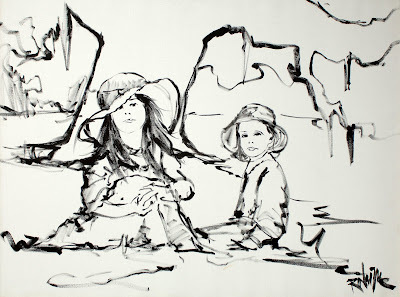 In addition, these works often include family homes, pets, and other complex elements, occasionally incorporating only two or three people and other times a dozen or more. 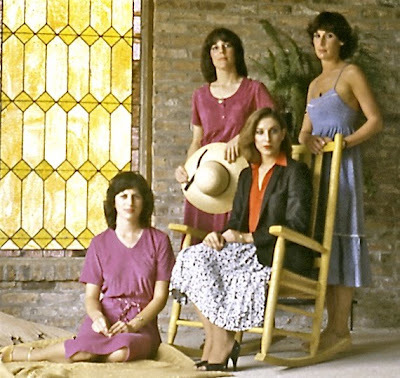 To prevent changes down the line, George begins with a sketch, submitted to the family for approval, as with the Bode girls below, Mathilda and Josie, from 1987. 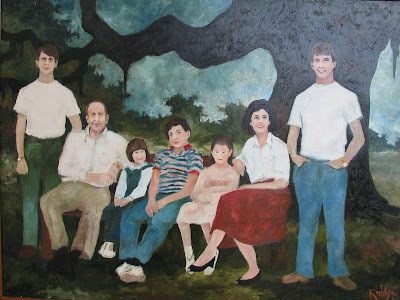 Oftentimes the client’s instructions include an enormous canvas, as in the Fortino Family Portrait. At nearly eight by ten feet, the painting posed logistical problems from the beginning. I remember visiting George in Lafayette, Louisiana in 1996 as he worked on this canvas in his garage, where he stood, kneeled, and crouched on the floor for weeks, because the painting would not fit through the door of his studio. It is interesting to note that George’s first such portrait was not a commission (or really, a family). He based the Aioli Dinner (1971, pictured below) on the Gourmet Dinner Clubs of the early twentieth century occurring in and around his hometown of New Iberia, Louisiana. Although not a family gathering, the dinner scene does include both George’s uncle and grandfather. 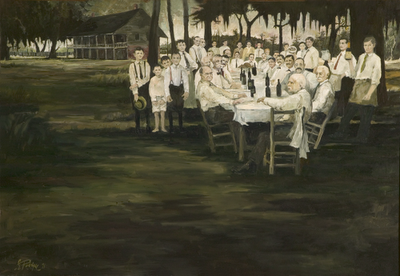 It was following paintings such as The Aioli Dinner and The Class that people associated George Rodrigue with personal, heirloom-type works, such as the family portrait. Inherently wary of accepting commissions due to their limiting nature, the money from these large-scale, complicated pieces was good from the beginning, easily off-setting any artistic compromise, especially if the timing was right (as with the recent portraits at the bottom of this post). 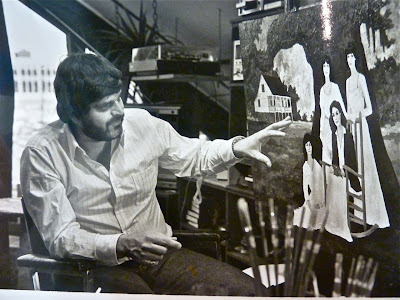 Prior to the sketch, George photographs the family, arranging his composition and gaining the patron’s approval before he lifts his brush, as with the de la Houssaye Sisters from Crowley, Louisiana (1985). 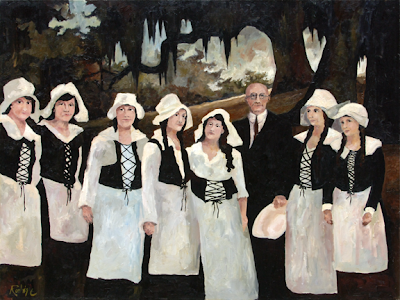 George paints the women like four Evangelines, placing them on the grounds of the original de la Houssaye home, built when their early Louisiana ancestors acquired a Spanish land grant, and now a historic landmark located in the Longfellow State Park in St. Martinville. (In a funny aside, Dr. Armstrong, whose family portrait appears in this post, sat in for the President. George merely replaced their heads, as you'll notice if you compare the two paintings. 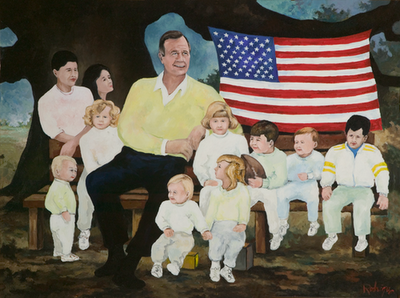 The George Bush painting hangs today in the family’s home in Houston, Texas. For a detailed history of this painting, as well as Reagan’s portrait, visit here). Although he rarely takes commissions today, occasionally George makes an exception for the family portrait of a friend or long-time collector. 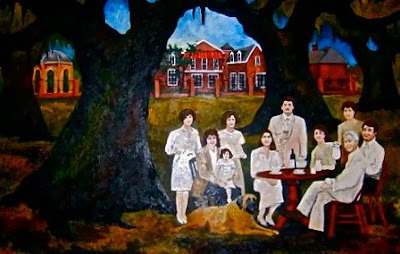 This was the case with The Sartain Family, pictured below in front of Ancient Oaks Plantation in Bastrop, Texas, and painted in 2005, as the Rodrigue Gallery business stalled in the months following Hurricane Katrina. This was also the case with the Doré and Brunet Family, in a painting called The Championship Ring from 2010, celebrating the marriage of Katharine Bush and Jason Doré (pictured far right), a long-time family friend. 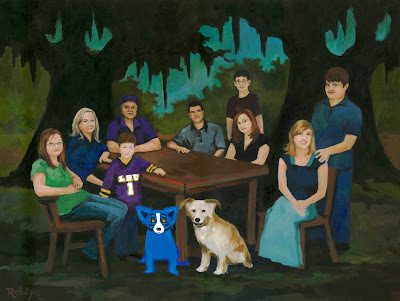 George was pleased to include their special request in this painting, the Blue Dog, pictured as a member of the family within a typical Rodrigue landscape. 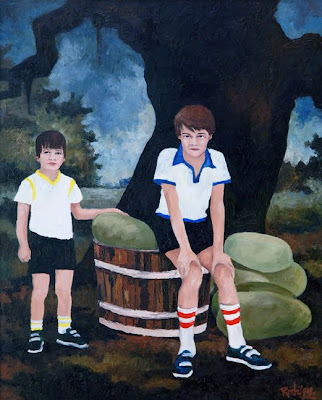 It is ironic that after several dozen family portraits over the years, George never painted his own family in this way. 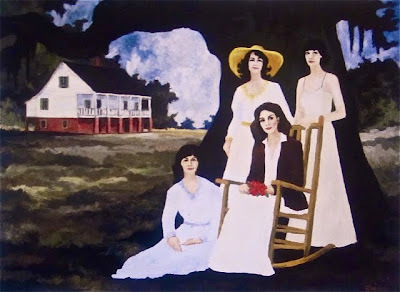 In the early years especially, when unburdened by the restrictions of a commission, he was more likely to paint a slice of Cajun history, as in the Daughters of André Chastant from 1971, below. 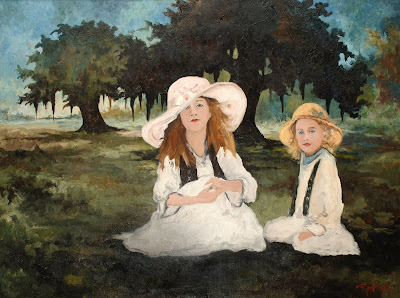 (While running for sheriff, André Chastant dressed up his daughters as early Acadians – as Pilgrims, in effect – and sent them out into the parish on the campaign trail, emphasizing the necessity of preserving the Cajun culture; learn more about this painting here-). These days George is more likely to embrace the family photograph as opposed to a painting. 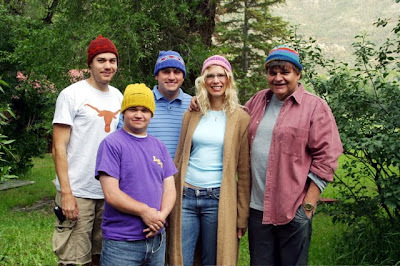 I leave you with one of his favorites, from a Wyoming vacation a few years ago, and picturing from left: André, Jason Doré, Jacques, Wendy, George. And for you readers who need a reminder, check out the post under POPULAR MUSINGS on the right, specifically 'A Santa Fe Story' under GEORGE'S FAVORITES. Recipe???? I have never made a gypsy stew. Came down to leave you a comment and got a stew recipe out of it! Bonus! Wendy, have you written a blog about his thoughts or experiences with the different Presidents he's painted? I bet he has some interesting insights into their personalities. I love reading about our political leaders on a personal, not political, level. Anyway, I'm searched the blogs but didn't see one on just President pictures and stories. I love the way George remembers and shares small details. Happy 4th to you and George! I used "Tee George on the Bull" for my holiday Timeline pic. Love that one. Hi Alana- Great to hear from you! Yes, I've written separate posts on each of the Presidential portraits and the stories behind them. If you look on the right side of the blog (any page) you'll see under PORTRAITS listings for Reagan, Bush, and Clinton. Each one links to detailed posts. Thank you, as always, for your interest. And Happy 4th to you and yours!